With its small island charm, lush vegetation surrounded by powder-white so sand, and a house reef that a myriad of tropical fish call home, the island is just about 350 metres in length and can be walked in just 10 minutes and a bit! Thatch-roofed villas inspired by local architecture are set amidst verdant gardens or are poised over the turquoise lagoon. Deceivingly modest exteriors hide worldly comforts and indulgences and all villas off er direct access to the beach or to the sea. Designed for couples seeking to rekindle their romance or for families looking to spend quality time together, Maafushivaru offers an experience that elegantly combines a Maldives from times-gone-by with the contemporary luxuries of the present. These are surrounded by abundant vegetation and located right beside the beach, with sun loungers on a private deck facing the sea. The bathroom is semi-open air with shower. Whilst an outdoor garden area has a rainfall shower made of stone. The Pool Villas come with two separate villas, each with their own open air bathroom with rainfall shower with the addition of a private pool, shared between the two villas. These villas are perfect for families or for friends holidaying together. Each Pool Villa has a shared entrance with a corridor and a separate dining pavilion. On the beach side there is a deck with sun loungers. These magnificent villas are built out over water and offer modern comforts same as the Beach Villas, along with stunning views of the lagoon. Each villa is completely private, being accessed by its own walkway from the main jetty. The bathroom features a rainfall shower and a bath with hot and cold water and offers views of the ocean. Outside is your own wooden deck with a seating area and sun loungers from where you can watch the multicolored tropical fish swim by. The Cuisine Gallery serves breakfast with a wide choice of dishes, a light affair for lunch and a combination of Mediterranean-inspired buffets and set menu for dinner, with a weekly Maldivian-themed dinner. The restaurant is set close to the beach and has open air seating with an additional terrace overlooking the lagoon. This coffee shop serves a selection of teas, specialty coffees such as cappuccino and espresso, or hot chocolate during the day. High Tea is available here between 15.00 and 17.00 for our guests on the All Inclusive package. You can choose from our impressive collection of quality wines from around the world. Savour exclusive wines with our wine tasting sessions, on offer once a week. An ideal place to chill out and enjoy a refreshing drink while gazing at the sparkling turquoise waters of the lagoon. Our bar offers a wide range of delicious signature cocktails, fresh juices, soft drinks, cold beers and sheesha. You could also learn to make colourful cocktails with us at Water Bar. In the evening there is an option to select from an à la carte menu which features a selection of our favourite dishes. You can book your table for this option on the sundeck looking over the sea or on the beach. 135° East is our contemporary Teppanyaki and Sushi restaurant located on its own sunset pavilion over the turquoise lagoon. The perfect location to enjoy the tastes of the Far East from the teppan grill and sushi counter. For the ultimate romantic dinner for that very special occasion or even just to spoil your loved one, why not book an intimate dining experience in a private setting for just the two of you or better, take an epicurean journey to Lonubo and pamper you and your significant with a five course meal. For some peace of mind, why not book all inclusive? All Inclusive package includes your meals in the Cuisine Gallery, high tea, selected beverages including soft drinks, canned juices, selected spirits and liquors, a wide range of cocktails, house wines by the glass, draught beer and house mineral water, snorkelling equipment and a sunset cruise. Situated on a quiet corner of the island on its own jetty, The Spa is the place where we blend inner beauty with the beauty of the landscape. Each treatment we offer is individually designed to help you realise your ultimate state of wellbeing. The Spa facilities include 5 treatment rooms, consisting of 1 couple’s room, 1 couple’s suite, 1 aesthetic beauty care room and 2 massage rooms. The Spa also includes a fully equipped gymnasium to help you keep fit whilst on holiday. Our signature product line, Voya uses hand harvested seaweed to provide organic treatments to our guests that blend well with our environment. What better way to fully experience the abundant marine life and colourful corals than to be right there amongst them? Our PADI and SSI dive centre, with enthusiastic multilingual instructors offers a wide range of underwater adventures catering for all levels from beginners to experienced divers. Snorkelling is a must in the Maldives. If diving isn’t your cue, you can still experience the beauty of marine flora and fauna while staying afloat with the aid of a snorkel, mask and flippers. Our team is available to help beginners gain their first taste of the wonderful underwater world in the lagoon before progressing onto the house reef or even a boat trip to snorkel at the Coral Garden. For more experienced snorkelers there is a range of full morning snorkel safaris by boat to other reefs, all guided by the resident marine biologist who helps you identify what you see! 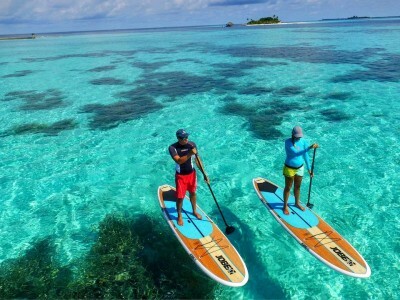 Diverse excursions are available for you to choose from, ranging from a visit to local island Dhangethi, to fishing trips, sunset cruises and island hopping trips. Day trips and romantic dinners are organised at Lonubo, the small deserted island just a few minutes away. Our water sports centre has an array of windsurfing equipment, catamarans, kayaks, standup paddleboards and pedaloes. If you are new to windsurfing or sailing, our team will be happy to ‘show you the ropes’. The range of entertainment at Water Bar includes beach discos, laser shows, acoustic music by two piece duo, stimulating discussions on the majestic ocean by our resident marine biologist and movie nights on the beach, under a starlit sky. Sited in the next lagoon, just a few minutes away, is Lonubo, a stunning deserted islet where you can choose to while away your days. A visit to this beautiful island is a must! Guests can choose from daily visits for basking in the sun and snorkel the beautiful reef, or book and enjoy an overnight stay on an island just for you and your beloved. Several times a week, set inside a ‘Dhoni’ or a Maldivian boat, you can enjoy tropical cocktails with fiery sunsets in the backdrop, and continue on to dinner with a menu that features our best grills. 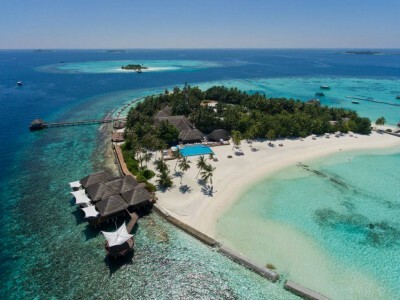 Be the first to review Maafushivaru Maldives.